In the classic figure of the Grim Reaper, there is such a composition. 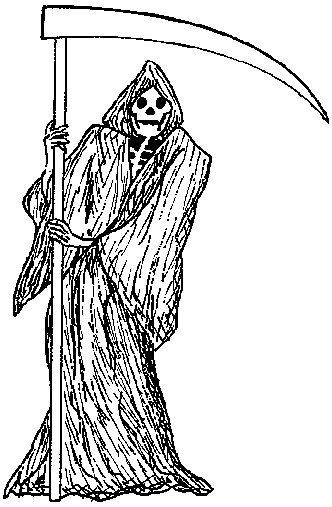 The term "reaper" is based on the metaphor of People as Plants: just as a reaper cuts down wheat with a scythe before it has gone through its life cycle, so the Grim Reaper comes with his scythe indicating a premature death. The metaphor of Death as Departure is also part of the myth of the Grim Reaper. In the myth, the Reaper comes to the door and the deceased departs with him. The figure of the Reaper is also based on two conceptual metonymies. The Reaper takes the form of a skeleton---the form of the body after it has decayed, a form which metonymically symbolizes death. The Reaper also wears a cowl, the clothing of monks who presided over funerals at the time the figure of the Reaper became popular. Further, in the myth the Reaper is in control, presiding over the departure of the deceased from this life. Thus, the myth of the Grim Reaper is the result of two metaphors and two metonymies having been put together with precision.